Emergency preparedness is a proactive, coordinated and effective response to emergency situations that will ensure the safety and protection of patients, visitors, staff and all persons who enter the Pembroke Regional Hospital. 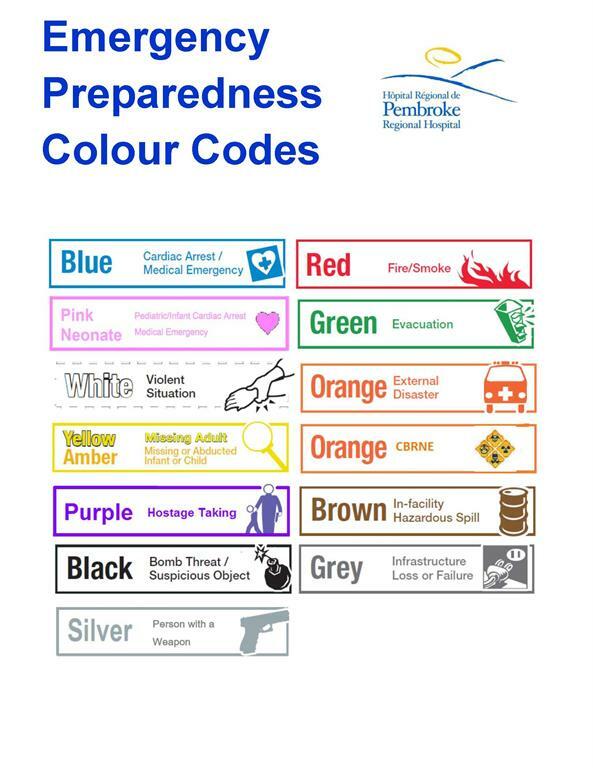 A colour-coded chart describing the names and context of each emergency code is used at the hospital. PRH uses a colour system to help indicate different emergency situations. The primary method fo r communication is rapid with an overhead public announcement. This notifies staff of the code colour and the responses they will have to take to protect the safety of all individuals within the hospital. Throughout the hospital, you will see Emergency Preparedness Stations that list emergency colour codes and procedures. Staff are trained and practice emergency responses through a series of education. Please follow staff direction upon hearing a code colour announced over the public address system. When you hear the fire alarm (code red) during your hospital stay, please remain where you are. Once you hear the “all clear” over the public address system, you may continue with your normal activities. For more information about Emergency Preparedness at PRH, please find attached here a link to our Emergency Preparedness Training presentation.